Mango Bay is a large estate featuring seven bedrooms, a full on-site staff, and easy access to some of Barbados most popular attractions. The villa feels pretty private because it’s surrounded by trees and has its own stretch of beach right outside the door. There’s also a large pool and stunning landscaped gardens to explore. Speightstown and Holetown are just a short drive away for shopping, restaurants, and island nightlife. 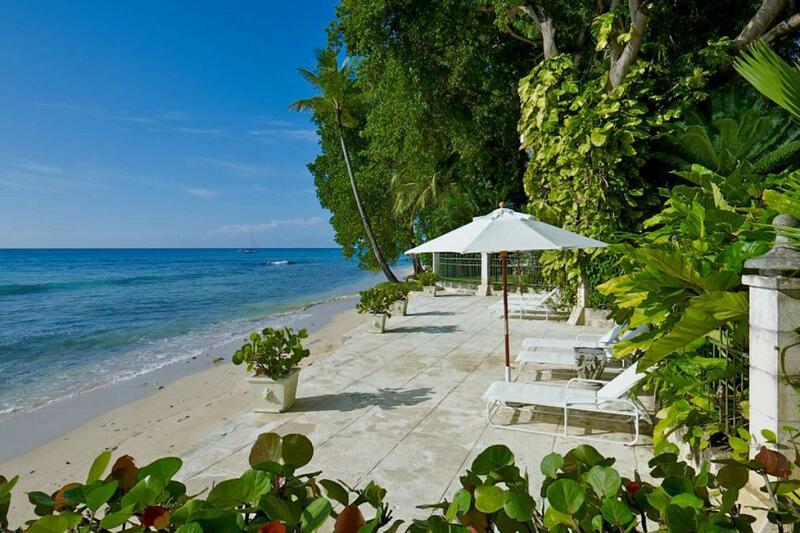 Mango Bay is set in verdant gardens between Reeds Bay and Alleynes Bay on Barbados’ Platinum Coast. This vacation rental feels like a regal conservatory, with a full staff to make any guest feel like royalty. The villa’s expansive tiled courtyard welcomes guests with plenty of parking and a frame of greenery. A wrought iron gate leads to the beach deck, where stunning sunsets and calm waves create a tropical backdrop. The villa enjoys direct beach and sea access without feeling exposed. The sea breeze blows through the dining gazebo, which has seating for 10 and a birdcage chandelier overhead. A lush garden courtyard lets weary travelers meditate and unwind under a canopy of leafy foliage. Walk through the gardens to the fresco fountain, where trickling water calms the senses. Watch lily pads float through the pond, or sit amongst the white wrought-iron lounging area with a glass of Chardonnay in hand. The pool is framed with a tall fence and even taller greenery, and a stone patio with loungers runs around the border. A columned wraparound porch connects to the main house, which enjoys Antebellum architecture. The elegant formal living room flows out onto the wraparound porch, inviting guests to linger over the views of the gardens and the sea beyond. Inside, it connects to a wine store, study, and a powder room. Tropical artwork and opulent accents combine in the sitting room, and a long marble table sits under the chandelier in the formal dining room. A chef will prepare meals in the gourmet kitchen, and a housekeeper and laundress keep the interior tidy. A butler waits on guests’ every need, and security maintains safety. For quiet relaxation, there’s a detached study with a TV and an extensive library. Communications are kept open with four telephone lines, including a fax line and an internal intercom. The main house has 7.5 bedrooms, and the half bedroom is a nanny’s suite with a twin bed. Each suite is air-conditioned and has a private bathroom. The master suite, with its adjoining marble bathroom, has two twin beds that can be made up as a king, remote-controlled air-conditioning, and two telephone lines. There are two more king suites, each with ensuite bathrooms. The remaining two suites each have two twin beds. The cottage, set back on the southern lawn, offers two fully air-conditioned king suites. Mango Bay is located between Holetown and Speightstown, with the closest hotels being Glitter Bay and the Royal Pavilion. The Royal Westmoreland Golf and Country Club is just a five-minute drive away. 31ft x 15ft 6ft at the deep end and 3.5ft at the shallow end. Located directly on the beach. Excellent swimming to either side of the villa.